Black Butler has had an interesting history when it comes to adaptations. The first series was released in Japan almost nine years ago, and since then two more series, several straight-to-video releases and, later this year, a film have been followed. The original Black Butler series saw A-1 pictures adapt and go beyond the manga at the time, taking Ciel Phantomhive and his demon butler Sebastian down a more fatal path than expected. Their Faustian contract came to a head and Ciel was left with no choice but to accept his grim fate. The second instalment was released a year later and featured an off-kilter original story that desperately pandered to fans, introducing new characters only to throw them aside in favour of Ciel and Sebastian. The series disappointed fans and critics alike, and A-1 Pictures did not return to the franchise for another four years. Going back to the series’ origins, the new season Black Butler: Book of Circus follows the fourth arc of Yana Toboso’s manga and is almost exactly the same onscreen as it is on the page. In it the Queen’s guard dog is tasked with investigating a series of child disappearances which occur whenever the mysterious Noah’s Arc Circus comes to town. After visiting the show, Ciel and Sebastian decide the best way to find the children would be to infiltrate the establishment and the pair pretend to be new recruits so they can come into contact with those running the show. Once there, they meet ringmaster Joker and his team of skilled performers who seem pleasant at first, but it’s clear that something is hidden beneath the surface and the sinister plot has more in store for Ciel than he realises. Producing a faithful adaptation of the manga was a good decision on A-1 pictures’ part. Yana Toboso has created an excellent storyline in the Circus arc, one that brings out the best in both old and new characters and explores the relationship between Ciel and Sebastian in an intriguing way. When A-1 Pictures took the first and second series of Black Butler in a new direction, it felt like the essence of the characters were lost somewhere along the way, but now it looks like they’re back on the right track. One thing that is so appealing about Toboso’s story is the way in which she approaches her lead characters, their true nature, particularly Sebastian’s, is never too far away from the surface. He may be doing Ciel’s bidding now, but that doesn’t mean he’s forgotten the reason why he’s taken on the role. Black Butler: Book of Circus features the first signs of these revelations, and it’s interesting to see how this affects their dynamic and the way they see each other. Another thing that works in the series’ favour is the good balance between comedy and drama. Although there is a clear delineation between the two, and comedy is predominantly featured in the first half rather than the second, there are also times when it is fused well in the story. When the Circus performers are trying to lure a little girl away with them and are caught by the police, for example, the scene is told through the point of view of the hypnotised girl. In it she sees events unfold like a dream, everything is pink and fluffy, the police are teddy bears, and when Joker et al attack them streamers spout out of their bodies instead of blood — to her it’s all fun and games. It may be a rather dark scene, but its presentation provides an interesting juxtaposition between the two genres. With the combination of excellent writing and interesting lead and supporting characters, it definitely looks like the anime is back on top form. Gone are the awkward corset-tightening scenes and attempts to fuel fan fiction and in its place is a more focused and fascinating story. There may have been a shift in tone for the series but this darker story provides a more compelling depiction of two damned souls unable to escape each other’s grasp. It’s good to see the anime doing so well again. 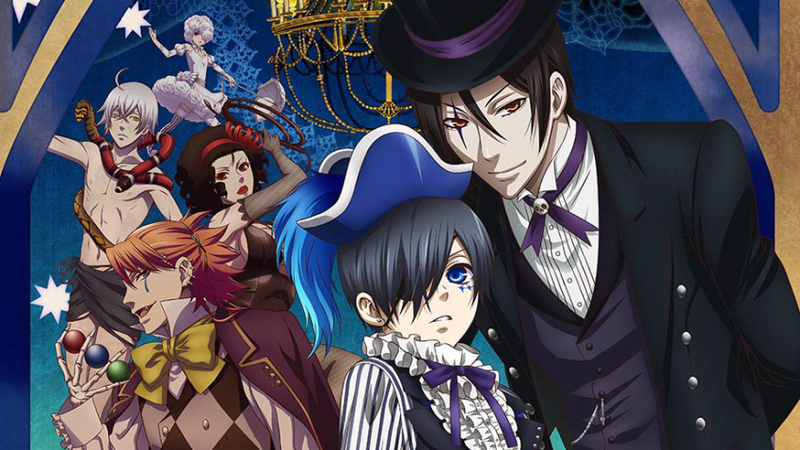 Black Butler: Book of Circus is released in the UK by Anime Limited.